Indulge your obsession for this summer footwear staple. Click through our ultimate gallery of the most fun and colorful pairs you can snag this season. In a country as laidback and sunny as ours, it is quite common to see almost everyone strutting around in flip-flops (particularly on weekends), not just on the beach but around the city as well. If office dress codes actually permitted it, we're quite sure it would be every Pinoy's daily footwear (they do offer your feet such freedom and comfort no pair of heels, wedges, or even flat shoes could ever provide)--from the office to the mall, to a party, or even to a date. With something as wearable and comfortable as this travel fashion staple, it’s no wonder that various fun activities and accessories have been created to complement them. 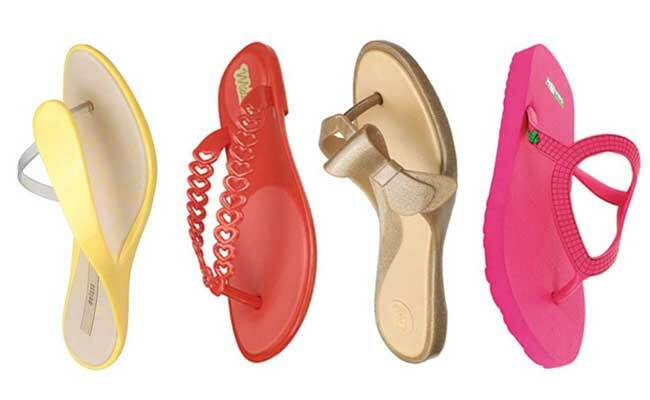 With Holy Week fast approaching (and with it, your much-awaited break), we thought of treating you to a photo gallery of 132 pairs of the latest flip-flop styles from popular brands Havaianas, Fitflop, Ipanema, Hotflops, Ripples Rio Punch, Melissa, Sanuk, and Olukai (all are available in leading department stores and malls nationwide). Take your pick from dark and muted ones to neon-colored pairs, in either girly, cutesy rubber or plastic designs, or edgy metallics and leather. We have scoured the metro for fun, fab designs that will surely rock those socks off your feet, for you to slip into a festive pair of summer flops to welcome our favorite time of the year! Launch the gallery and get ready to view a color-coded compilation of this season’s latest styles, followed by a series of flip-flops with unique embellishments (from crystal studs and bows to wild animals and fruits!). Choose one that will best fit your style and personality. Don’t forget to match it with your fave swimsuit to stay fashionable under the sun.